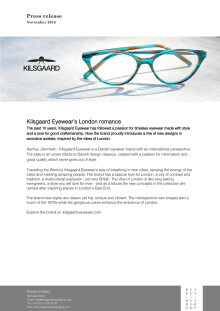 Aarhus, Denmark – Kilsgaard Eyewear is a Danish eyewear brand with an international perspective. The style is an urban tribute to Danish design classics, created with a passion for minimalism and good quality which never goes out of style. Travelling the World is Kilsgaard Eyewear’s way of breathing in new vibes, sensing the energy of the cities and meeting amazing people. The brand has a special love for London, a city of contrast and tradition, a multicultural explosion - yet very British. The vibe of London is like long lasting evergreens, a style you will love for ever - and as a tribute the new concepts in the collection are named after inspiring places in London’s East End. The brand-new styles are classic yet hip, unique and vibrant. The retrospective new shapes add a touch of the 1970s while the gorgeous colors enhance the ambiance of London. The large shape in combination with the subtle details like the toned-down coloration and soft matte finish creates a confident look. A true salute to The Marksman, the first Public House in all of London to be awarded the Michelin Pub of the Year. A delicate feminine shape, slightly pointed and elegantly transparent. Made to be stylish and sophisticated, paying tribute to the majestic architecture of the famous church with bells that chime over East London. Named after a great pub in East End of London, which has the most amazing new chef and serves great food. The look is contemporary and stylish, with a solid double bridge and a clear reference to the style of the 1970s. The diversity and laidback attitude of Stokey, the hipster heartland of London, set the tone for this cool style from Kilsgaard Eyewear. The look is oversized, yet small and the design has a clear reference to the 1980s.